Distance relays are double actuating quantity relays with one coil energized by voltage and the other coil energized by current Fig. (1). The torque produced is such that when V/I reduces below a set value, the relay operates. During a fault on a transmission line the fault current increases and the voltage at fault point reduces. The ratio V/I is measured at the location of CT's and VT's. The voltage at VT location depends on the distance between the VT and the fault. If fault is nearer, measured voltage is leaser. If fault is further, measured voltage is more. Hence assuming constant fault resistance each value of V/I measured from relay location corresponds to distance between the relaying point and the fault along the line. Hence such protection is called Impedance Protection or Distance Protection. Distance protection is non-unit type protection, the protection zone is not exact. The distance protection is high speed protection and is simple to apply. It can be used as a primary and back up protection. It can be used in Carrier Aided Distance Scheme and Autoreclosing Scheme. Distance protection is very widely used in protection of transmission line. R-X Diagram are useful in plotting characteristic of Distance relay. The three variable V,I and Φ are converted into variable R and X. Impedance Z1 is defined as ratio of r.m.s values of V and I, i.e. Φ is positive if I2 lags V1 , Φ is negative if I leads V1 . Thus V1 , I1 and can be converted on R-X diagram as shown in Fig. (2). The family of impedance relay (Distance Relays) can offer wide range of characteristics. The basic principle should be understood and need explanation. Relay which measure impedance but responds to faults on one direction only called directional impedance relay. Their characteristic on R-X plane is a semi-circle on an inclined line. The centre of semi-circle is at centre of R-X diagram. 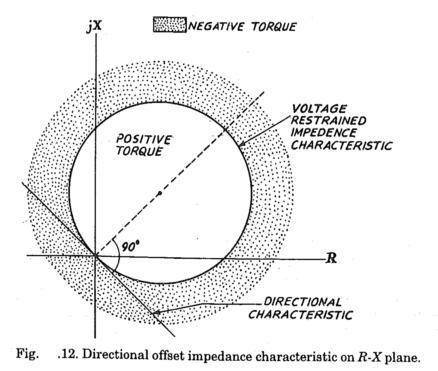 Relays having voltage restraint in additional to directional and impedance elements have a circular characteristic on R-X diagram but with centre shifted from origin. Mho-relays have a circular characteristic, the circumference of the circle phases through the origin. The detail explanation about these characteristic has been given below. The term impedance applied to resistance plus reactance. We know that the ratio of voltage across a branch to current gives impedance of the branch, i.e. The impedance relay operates for certain condition of the ratio V to I which may expressed.as impedance. In any impedance relay, there are tow actuating quantities namely V and I. The current gives operation torque. The voltage gives restraining torque. The characteristic in terms of V and I is shown in Fig (5). The impedance relay can be made to sense the ratio between voltage and current at a point on the line. In such a case we can say the relay is sensing the impedance The impedance between the location of CT and VT and the fault is proportional to the distance between the above location and the fault. 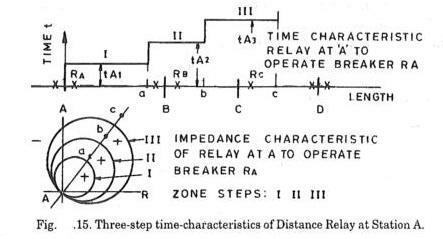 Hence impedance relay is called distance relay. Such a relay operates if the impedance is below that of the relay setting. hence if the fault is within a certain length of the transmission line. Mho type relay ; measures a component of admittance Y. 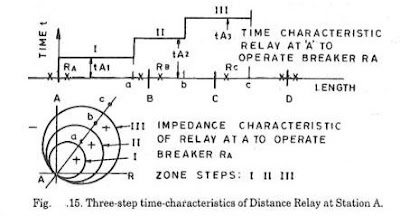 A distance relay is one whose operation is based on measurement of impedance, reactance or admittance of line between the location of relay and the fault point. 3.1 R-X Diagram of Plain Impedance relay. In Fig. 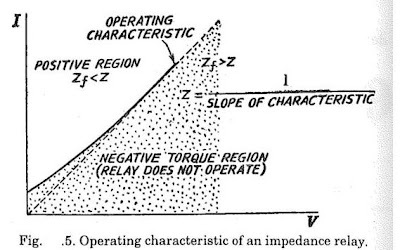 (5) the operating characteristic of an impedance relay on V-I plane. It is in the form of a straight line. By adjustment, the slope of the operating characteristic can be changed. The more convenient way of describing the operating characteristic of a distance relay is by means of 'Impedance Diagram' or R-X diagram. Since the relay operates for certain value, less than the set value of, the Z operating characteristic is a circle of radius Z. 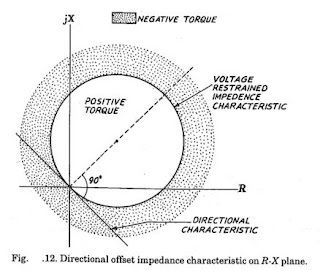 Any value of Zf less than the radius of the circle produces positive torque. Any value of If more than the radius, of circle produces a negative torque and relay does not operate. This is a rule regardless of phase angle between V and I. The plain impedance characteristic shown in Fig. 7(b) is the simplest in use and consists of a circle with center at the origin. Operating occurs in the shaded area inside the circle. The significance of this is that the relay operates below certain impedance level, which is independent of the phase angle between voltage and current. A straight line on VI plane Fig. (5) having a constant slope gets converted into a circle of radius V/I on R-X plane. 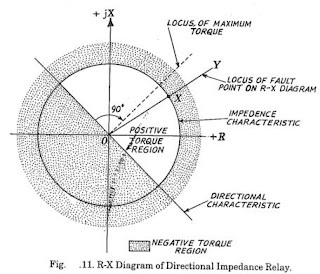 The resistance and the reactance between the relay location and fault can also be plotted on R-X diagram as shown on Fig.7(a). The angle α will depend upon the ratio R/X of line per unit length. For a given fault condition, the measured impedance can be marked on this line Fig. 7 (a). The line can also be superimposed in the relay characteristic Fig. 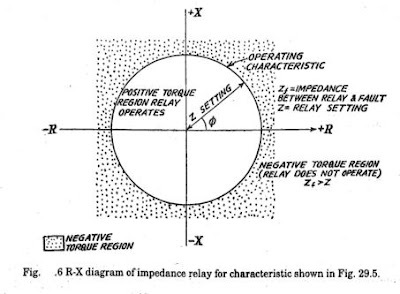 If the measured impedance of the line is within the circle, the relay operates, the circle gives the relay characteristics. 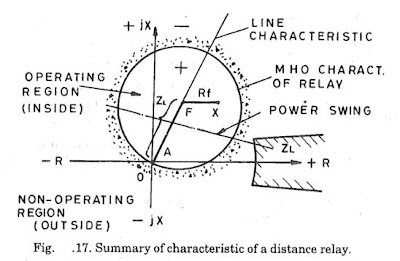 The distance along transmission line can be represented by a line on R-X diagram. By superimposing the line characteristic,on the relay characteristic, the operation of the relay can be predicted. (referring to Fig. 8). OX represent the feeder on RX diagram. If fault occurs within distance OX, the relay operates. For fault beyond X region XY, relays does not operates. Plane impedance relay has the following disadvantages. - It is non directional. It responds to the faults on both sides of CT,VT location. Hence it can not discriminate between internal and external faults. - It is affected by arc resistance of line fault and result in under-reach. Fig. (9) shows a typical operating time us. Impedance characteristic of high speed impedance relay for one value current. For other current similar characteristics are obtained. 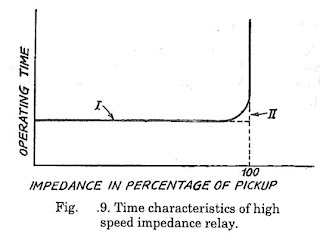 It is observed that for impedance values above 100% pick-up impedance, the relay does not operate. The curve I represents actual characteristic. Curve II is simplified representation of the same (right angle instead of curve). The relay unit used for distance protection are double actuating quantity instantaneous relays. The electromagnetic relays of balanced beam type or induction cup type are preferred. Static impedance relay are preferred in modern installations. 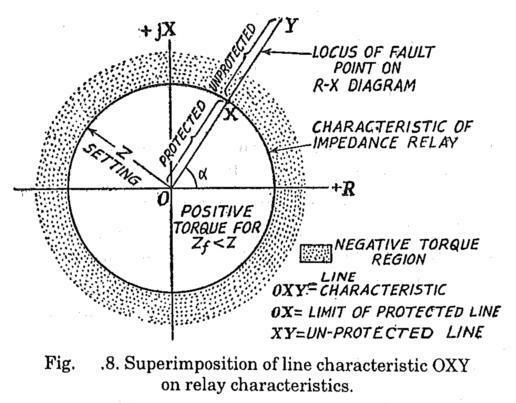 Characteristic of various types of distance relays of R-X plane are in form of circles or sectors of circles. There are mainly three categories of these characteristics on R-X plain. - Circle with centre at origin. - Circle with circumstances passing through origin. - Semi-circle above a directional line passing through origin. - Circle enclosing the origin. - Circle cut-off from top by a line parallel to X-axis. These varieties of characteristics are obtaining by changing the operating coil/restraining coil design, providing the additional polarised coils supplied by voltage or current, providing tow or more elements within a single relay case. The type of relay can be identified on the basis of the form of characteristic on R-X plane. 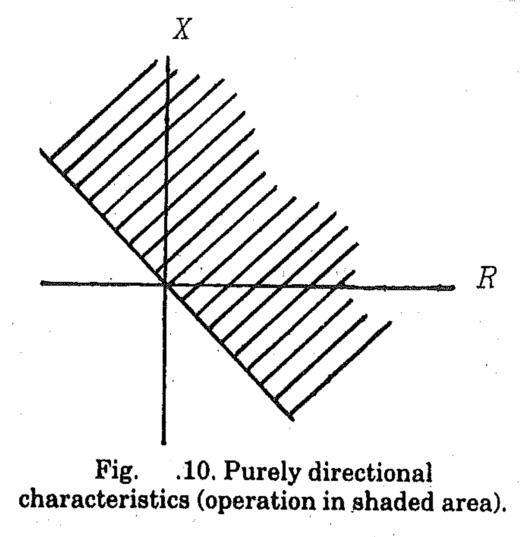 The characteristic of transmission line is, as a rule, a straight line on R-X plane. The length of the line is proportional to the length of transmission line. 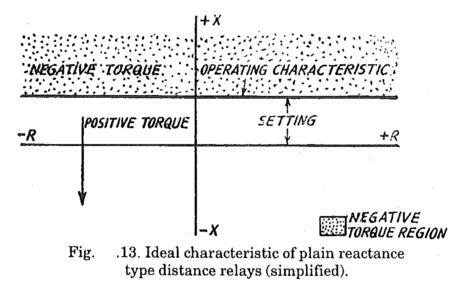 The length of transmission line covered by positive torque region of relay characteristics indicates the reach of distance relay, i.e. The length of line protected by the relay. - Impedance between fault point and relay location is less than the relay setting Z. - The fault power flows in a particular direction from relay location. 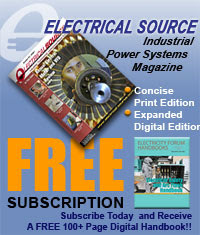 The direction power flow is sensed by measuring phase angle between voltage and current. 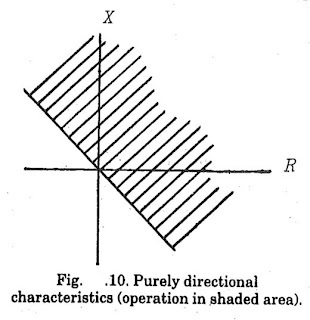 The characteristic presented on R-X diagram is a straight line passing through the origin as shown in Fig (10). Operation takes place on one side of the line as indicated by shading. Suppose the location of fault, point (with corresponding R and X) is plotted on R-X diagram. In case of Directional Relay, the positive torque is provided when the fault point lie on right hand side of the inclined line (Hatched area in Fig . (10)). This line when superimposed on the characteristic of plain impedance relay, we get final characteristic of Directional Impedance Relay Fig (11). With directional characteristic added to the plain impedance characteristic, the results in a characteristic with a sector of a circle Fig. (11). Consider a locus of fault point on transmission line (locus OY). 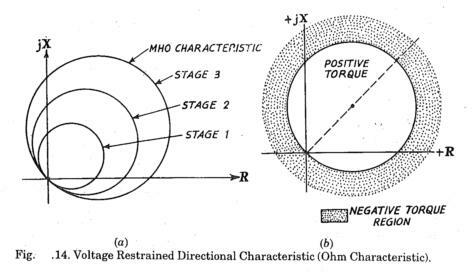 Angle ROY = α depends upon the phase angle between V and I with give setting of directional element, the operating torque is positive within the semi-circle with radius Z and on right hand side of the inclined line of directional characteristic DD'. - Locus OXY should have angle with angle DOD' given by directional feature. - Impedance measured by relay should be less than the setting Z. The directional relay responds to the phase angle between V and I at relay location. When the relay is on verge of operation. However, impedance characteristic puts another condition, i.e. V/I < Z represented by a circle on R-X diagram (Ref. Fig. 11). Hence the net characteristic of directional impedance relay is a semi-circle above a straight line passing through zero. (Fig. 11). The radius of circle corresponds to measured impedance. T = K1 - K2 (V+DI)2 (V+DI) is the voltage supplied to voltage coil of impedance relay. The characteristic when plotted on R-X diagram is a circle with radius V/I and with center shifted from origin. The circle may be completely 'offset' from the origin so much so that origin is left out of the circle. Directional feature combined with offset impedance characteristic is shown in Ref. Table (1). The reactance relay has a characteristic such that all the impedance radius vectors whose outer ends lie on a straight line having constant X component. X is the reactance of protected line between the relay location and the fault point. The reactance type distance relay has reactance measuring unit. The reactance measuring unit has an overcome element developing positive torque and a directional element (VI cosΦ ) which either gives a positive or negative torque. 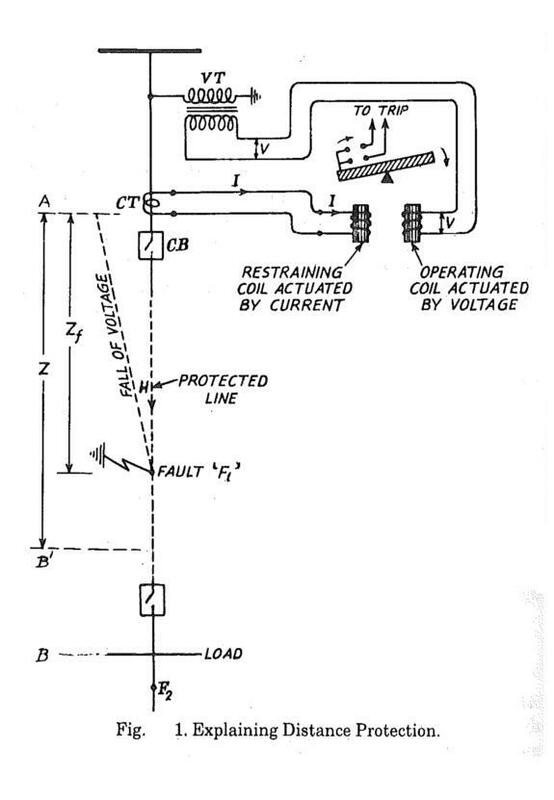 Hence reactance relay is an over-current relay with directional restraint. The complete characteristic of voltage restrained reactance relay is illustrated in Fig. (14). Mho relay is also known as admittance relay and measures a component of admittance Y<θ . It is also called as angle impedance relay. The characteristic of Mho relay on admittance diagram is a straight line. Characteristic is directional and will operate for faults in one direction relay only. Relative reach of the relay goes on changing for various ratios of R/X. The distance protection responds to the ratio V/I. The impedance relay is set for a value Z such that when the value V/I measured by the relay is less than the set value Z, the relay operates. Characteristic of Distance Relay are plotted on a R-X plane. Distance Relays are used for protection of transmission lines, distribution lines etc.These relays are generally high speed relays.Details about distance protection schemes are given in later. Distance protection schemes are used universally for protection of high voltage AC transmission lines and distribution lines. They have replaced the over current protection of transmission line. The success of distance protection is due to the following. - Faster operation - Simple co-ordination. - Less effect of amount of generation and fault levels, fault current magnitude. - Permits high line loading. - Simpler application ; permanent setting without need for readjustments. - Static distance relays have superior and versatile characteristic. - Phase to phase faults. In some schemes for short lines, the phase to earth faults protection sensing may be by distance relay and measurement by over-current relays because distance protection for shorter lines susceptible to errors due to arc fault resistance. In general, the choice of type of a distance protection depends on length of line, configuration of lines, whether single infeed/douple infeed, tripping time required and co-ordination requirements. 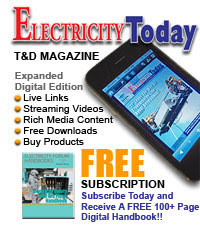 Todays trend is toward the use of static distance protection for all types of line faults, main and back-up for short, medium and long lines. The following paragraph give an overall review. Distance relay respond to the ratio of V/I. They measure impedance V/I or a component of impedance from the location of CT and VT. The measured V/I is proportional to the distance between the location of CT/VT and location of fault. Hence the relays are called distance relays. The operating limits of an impedance relays are usually specified in terms of impedance components resistance and reactance. It is convenient to describe the operation limits on R-X diagram on rectangular co-ordinates with resistance R on abscissa and reactance j-X on ordinate. The operating characteristics on R-X diagram in the form of geometrical figure such as circles or sectors of a circle or rectangles. Electromagnetic relays can achieve only circular characteristics. 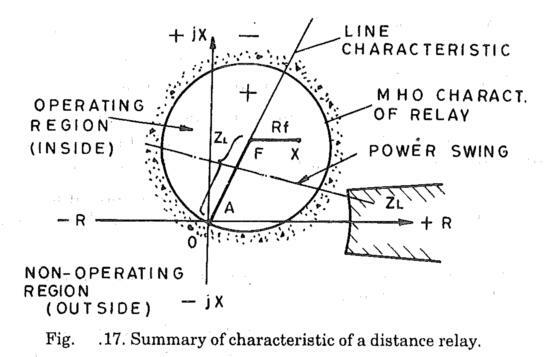 Static distance relays can achieve rectangular, quadrangular, lense, type, double mho and a variety of characteristics on R-X diagram. The choice of R-X characteristic is made such that the relay operates for line faults in the protected portion of line but remains stable during power swings. The geometrical figure on R-X diagram (a circle, quadrangle or a sector of circle) may be in the first or second quadrant of rectangular co-ordinates. The operating region is within the characteristic figure i.e. when the measured impedance component is less than the set value ( boundary of characteristic figure) the relay operates Fig. 7 (b). Ref Fig. 15. Refer Fig. 7 (a) representing line characteristics. The locus of line impedance before occurrence of a fault measured by the relay and plotted on R-X diagram is a straight line passing through the origin. The angle α of this line characteristic depends on natural ratio of R/X of line per unit length. (sinα = X/Z). Each point on the line represent certain distance from origin in terms of Z. The setting of the relay decides the radius of the characteristic circle or shape of boundary of characteristic. For per-determining the operation of relay in response to fault on transmission line, the line characteristic. Fig. 7(a) is superimposed on relay characteristic Fig. 7(b) as in Fig. (8). Refer Fig. 17 also. The fault point f shifts from line end towards O depending the location of the fault with respect to location of CT/VT (substation). For a fault away form the sub-station, the point is farther from origin. If it is outside the boundary of the characteristic figure, (circle or quadrangle). The relay does not operate. During a fault on line, (assuming negligible fault impedance) the V/I measured between origin and the fault reduces and the point moves towards the origin. If the point moving along the line characteristic comes within the characteristic of the relay (Fig. 8) the relay operation. 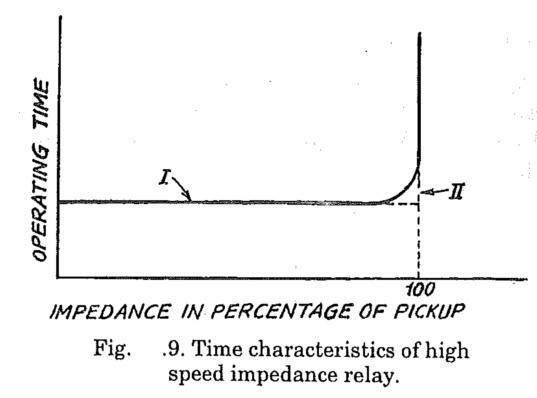 The time characteristic of high speed distance relays is a straight line (Fig. 9 ). The relay operates within set time. When measured Z falls within its pick-up value. If measured Z is beyond its pick-up value the relay will not operate. The long transmission lines are with intermediate substations. In each substation the distance relays are provided for line protection. The settings of these relays are set with respect of impedance (radius of characteristic circle) and operating time (position of horizontal step Fig. 9 ). 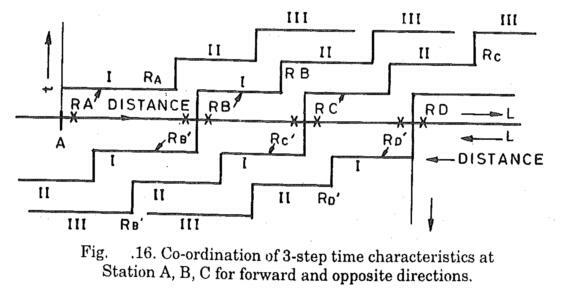 The distance relay in each sub-station has generally three step characteristic with respective setting of Z and t for each step. The three step characteristics of distance relay of each sub-station is achieved by providing three sets of relays in each sub-station for protection of each line. Fig (15). Ref Fig. 15. 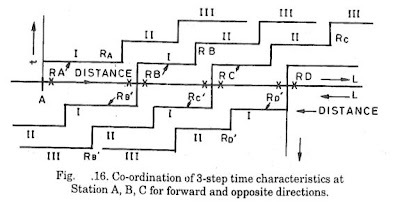 This figure explains a time distance characteristic of a 3-step distance scheme in substation A for one direction. These are three sets of relays for protection of each line. Each relays provides characteristic for one zone. The combined effect the distance scheme in substation A provides. - Primary protection of first zone AB with minimum time setting. Normally 85% of first zone is covered to take care of errors such as fault resistance. First zone. The first zone setting is 85 to 90%of line length and with highest speed of protection so that these relays operate at the earliest and will never operate for the fault in 2nd and 3rd zones. Also the margin of 15 to 10% takes care of fault resistance seen by the relay measurement as additional time impedance. Under reach. Suppose line impedance is ZLand arc resistance relay measures (ZL + Rf ) instead of measuring only ZL . Thereby the relay will see the fault as beyond its characteristic circle and will not operate even thoug it should have operated. This is called under reach Defin. Second Zone. The second zone relay at A provides protection for measuring 15 to 10% of line section AB. The relay is set to reach beyond the length AB and twenty to fifty per cent of the next line section BC. For achieving time co-ordination, the second zone relay at substation 1 is set with time t2 with a time delay of 0.2 to 0.5 seconds between the first zone t1 and second zone t2 . The primary protection for section BC is provided by first zone relay at substation B. Third Zone. The third zone relay at A provides Back-up protection for section AB, BC and CD. The primary protection for line section CD is provided by first zone relay at substation C.
Third zone protection at sub-station A is delayed by 0.4 to one second from first zone and 0.2 to 0.5 seconds from second zone. Fig. 16 illustrates the time distance characteristic setting of distance relays at station A, B, C for one direction. Similar relays are provided for other direction. - First zone. Primary protection to 85 to 90% on line AB (First zone) with time t A1 to operate breaker RA. - Second zone cover remaining 15 to 10% of section AB and about 20 to 50% of section BC with time t A2. - Third zone covering remaining 80 to 50% of section BC and further 20% of section CD. - First zone protects 85 to 100% of section BC as primary protection with time t B1and, second zone covering remaining 15 to 10% of BC with higher time. Third zone covering remaining protection of line BC and further 20% of line CB. - Relay at station B provides primary protection to Section BC and remote Back-up to DC, DE. 3. Relay at Sub-station C.
This provides primary protection to 85 to 90% of section CD as first zone protection with minimum time t C1. This is primary protection at sub-station C to operate breaker RC. The impedance characteristic of zone 1,2,3 are similar geometrical figures with different impedance setting (Fig.14). In case of static distance relays with quadrangular characteristics, the characteristics of three zones are in the form of different straight lines forming the quadrangle. A distance relay should be operate below set fault impedance within set time. It should not fail to operate for faults beyond protected zone. It should operate for faults within protected zone. It should not operate due to power swings. For the purpose of analysis and choice of settings of first zone, second zone and third zone distance relays in each sub-station and their co-ordination ; the R-X diagram is very useful. The following characteristics are plotted on the same R-X diagram. - Relays characteristic should cover the time characteristic. - Line characteristic (Straight line passing through origin). Relays characteristic should cover the line characteristic. Relays characteristic should be away from load region. Normal power swing should touch relay characteristic. Fig. 17. Load impedance is much higher than fault impedance and line impedance. Therefor, the distance relay does not operate due to change in load impedance under normal load conditions. During faults on the line the measured line impedance falls. Operating point suddenly comes from region ZLon line AB. This is represented by a straight line passing through the origin. During no load the point on the line represents the impedance seen by the relay from origin. During the fault, the relay will measure the line impedance upto fault point. Fault Resistance. The faults on overhead line will be arc faults having pure resistance Rf. This is represented by a horizontal line on R-X diagram. Total impedance measured by the relay is equal to line impedance upto fault point ( ZL) plus arc resistance (Rf) i.e. ZL + Rf. The relay characteristic should be broad in the middle ( Fig. 17) so that X is within relay characteristic.